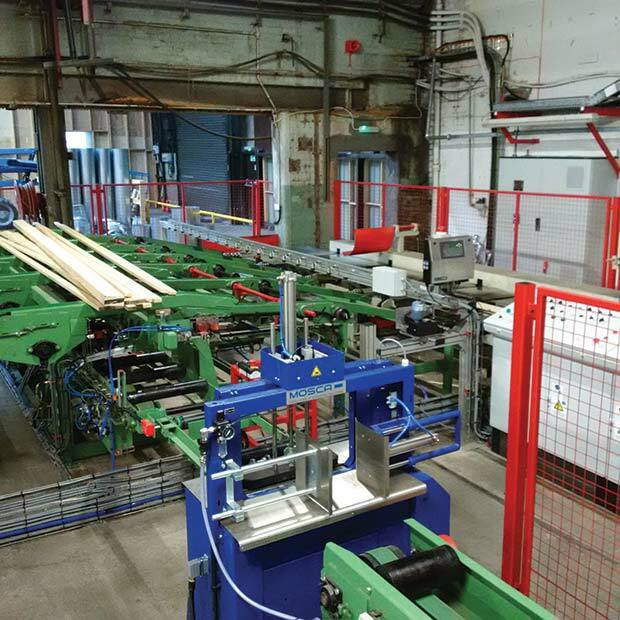 International Timber, the UK’s largest supplier and distributor of timber and panel products, has underlined the strong reputation of Mosca strapping technology with the installation of a Mosca ROMP-5 at its site in Grangemouth, Scotland. The new machine is part of a bespoke handling and feeding system that is being used to mould timber and pack in small bundles. The ROMP-5 features Mosca’s specially-developed, patented SoniXs sealing technology, which welds the strap ends using highfrequency ultrasonic vibration. This provides a faster and more environmentally-friendly solution than conventional heat seal methods as no warm-up time is required and energy is only consumed in the moment the strap ends are sealed. Other benefits of the machine, which can also be used by pharmaceutical, logistics and mail order businesses to name a few, include a step-less, 180 degree pivoting operation panel that can be operated from both sides, and a colour-coded display in the operation panel that provides visualisation of the machine’s functional status. A user-friendly strap coil change can be carried out from the front or the side, while strap tension is easily adjustable and a soft strapping function is available for especially sensitive packages. Top speed is 35 packages per minute, but the machine has the ability to be switched from maximum speed to a materialfriendly eco-speed via the control panel. International Timber uses its combined 200 years’ experience to maintain its reputation as the UK’s foremost supplier of quality timber. The company specialises in the importing, processing and distribution of a range of timbers including softwoods, hardwoods, panel products, cladding and decking, with a strong commitment to sustainability. “I know some of our other sites have bought from Mosca in the past, but this was a first for our particular site,” concludes Gary Madden.